While your child is in the hospital, we will work closely with you to create a warm, compassionate environment while providing excellent medical care. As a parent of a child at CHOC, you are an important part of the team working to make your son or daughter well. We would like to make you as comfortable as possible during your stay with us. Please see below for a list of family amenities and resources designed to make your stay a pleasant one, important information for patients and families and a comprehensive services guide. Where else can a kid be a disc jockey? 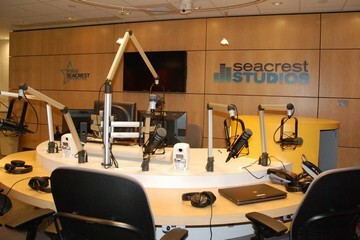 This interactive broadcast multimedia center provides our patients with an outlet to engage in radio, television and new media production. 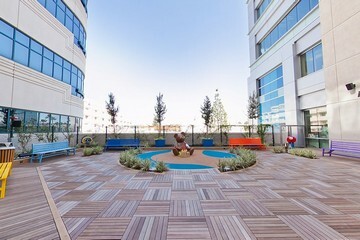 Patients can enjoy the southern California weather in our 3,000-square-foot play area. 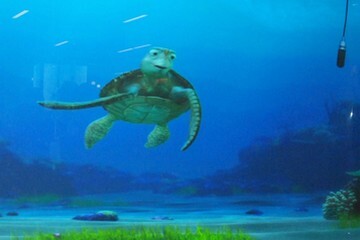 There is also an indoor play room for younger kids as well as a distinct place for our teen patients. 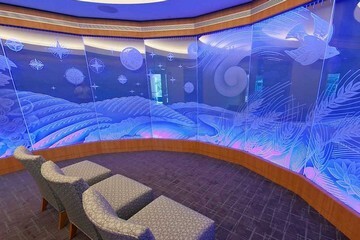 This beautifully designed space is a quiet and sacred place designed to accommodate people of all faith traditions. Home to a children’s library and adult business center, our Family Resource Center includes three multimedia stations that can be used to research information on pediatric illnesses and injuries. 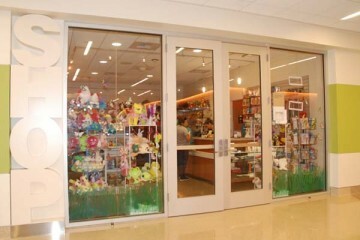 The Gift Shop offers a wide variety of merchandise for our patients, visitors and staff and will gladly take phone orders for items to deliver to any CHOC patient. Just call 714-509-8668. Breakfast 6:30 a.m. – 10:30 a.m. Lunch 11 a.m. – 3:30 p.m.
Dinner 4 p.m. – 7 p.m.
You may access the cafeteria menu by calling extension 12123 from inside the hospital (Monday – Friday only). The cafeteria cash registers will accept Visa, Mastercard, American Express and Discover cards. Gift cards may also be purchased through the cafeteria cashier. To access the café during these hours from the North Tower: please use the North Tower elevators to the second floor and then cross into the Holmes Tower second floor. From the Holmes Tower: please use the Holmes Tower elevators to get to the second floor. Room service is available 7 days per week. To place your order, simply dial 13663 (1-FOOD) on your room phone anytime between 7 a.m. and 8 p.m. for patient meals and 7 a.m. - 7 p.m. for guest meals (please allow up to 45 minutes for delivery). If you are on a modified or restricted diet, our call center operators will assist you with your selections. Parent guest trays are available for a fee of $5.00 per meal. Parents may choose from our room service menu. The service is available only on the medical and surgical floors and in oncology. Due to hospital regulations, parents of children in our PICU, CVICU and NICU are allowed to order a meal but it cannot be eaten in their child’s room. Room service staff accepts Visa, Mastercard and Discover cards. Vending machines are available on the first floor, near the CHOC North Cafeteria. For places to eat outside of the hospital, see our Area Resource Guide. Family Resource Center features a library full of books and references for families to learn more about their child's pediatric illness as well as general health and wellness. The children's section has books for all ages, and the facility includes a business center with computers, wi-fi, fax machine, printer and copier. 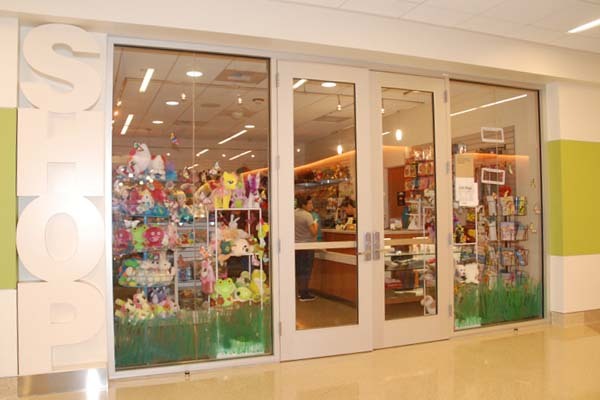 The Gift Shop is offers a wide variety of merchandise for our patients, visitors and staff and will gladly take phone orders for items to deliver to any CHOC patient. Just call 714-509-8668. Patients admitted to the third, fourth and fifth floors may attend the playroom located on their unit. Visitors younger than age 12 must be accompanied by an adult when attending the playroom. 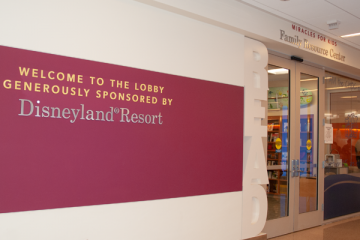 Arrangements can be made with the Child Life department for siblings of patients admitted to the NICU or PICU to attend the playroom on the fifth floor. If the patient is in isolation neither patient nor siblings are allowed in playroom. Playroom hours are posted. The cozy, 20-bedroom Orange County Ronald McDonald House is a place where you can rest without being far from your child. It is located a few blocks from the hospital. Our customer service representatives are here to help you cope with the complex hospital environment by explaining policies, connecting you with appropriate staff, answering questions or assisting with problem solving. Customer service representatives can act as a personal link to the hospital and ensure that your rights as a patient/family are respected. To contact a customer service representative, please call the Customer Service CARE Line at 714-509-3200. The hospital security staff can assist you in many ways, ranging from helping with car trouble to escorting you to your car after dark. Members of the security staff patrol the hospital and parking structures 24 hours a day. Please lock your vehicle and place any valuables in a locked compartment so they will be hidden from view. Valuable items should be left at home to prevent loss. Valuables that you must bring, such as a purse or wallet, should never be left unattended in a patient room or parent lounge. The hospital cannot be responsible for lost or damaged personal items. Security can help you locate missing items in our “Lost and Found.” If you should lose an item during your child’s hospitalization, notify the Security department. To reach Security, call 714-509-3900 from inside the hospital. The Burlew Medical Library at St. Joseph Hospital is open Monday through Friday from 8 a.m. to 4 p.m. The library is located on the first level of the Northeast Building, east of Pepper Street. If your child will be missing more than a week of school, CHOC has a teacher on staff. The teacher will coordinate lesson plans with your child’s school. A Wells Fargo bank automatic teller machine is available on the first floor of the north tower, near the cafeteria in the lobby of the CHOC North tower. You can buy the Los Angeles Times and the Orange County Register in the newspaper boxes located on Pepper Street. There is notary public service available nearby in the community. Please ask your nurse if you need assistance in locating one. A TDD device is available upon request. Please ask your nurse. CHOC Children's has both Inpatient and Outpatient pharmacy services staffed by professionals specially trained to understand the complexities of pediatric health care. The trained professional social workers at CHOC Children's recognize the impact of illness on patients and their families. The following is a resource guide of the hotels, restaurants (organized by type of food), grocery stores, drugstores, shopping centers, banks, transportation (taxis and buses), notaries public and churches/places of worship in the surrounding area. Please keep in mind that the listing does not provide an endorsement or recommendation from CHOC Children’s and is for informational purposes only. If you have any questions or concerns, or if you come across any portion of the guide that is incorrect or outdated, please contact Mindy Mahoney at mmahoney@choc.org. We believe everyone deserves special treatment and high quality health care. You and your family have rights and responsibilities under California law. We want you to understand and use these rights and responsibilities. With the increasing national and public focus on patient safety, CHOC participates in multiple initiatives to remain innovative in protecting our young patients from medical errors. Learn more. At CHOC, we are committed to providing the ideal patient experience. Learn more about our philosophy of patient and family centered care and how to provide us feedback about your experience. Parents and legal guardians are welcomed 24 hours a day. Other adults and children may visit between 8 a.m. and 8 p.m. Check with your nurse on the specialty areas such as PICU, NICU and CVICU for more specific guidelines. Visitors should not be ill or have been exposed to a contagious disease. Additional visitor restrictions may be in place during flu season. Click here for more information about visiting the hospital. Valet parking and self parking are available for patients, families and visitors. Patients, families and visitors park in the CHOC Children’s Hospital and Clinics parking structure. You can access the hospital through Admitting on the first floor and by the second floor parking structure bridge. Click here for more maps and information about our main campus in Orange. Learn about the rates for CHOC’s patient and visitor parking structure. All parents, guardians and visitors must check in and obtain a pass every day at the Admitting desk in the main lobby on the first or second floor. You may be given a long-term visitor pass. This pass allows the parent, legal guardian or surrogate to bypass the Admitting desk for as long as the visitor pass is valid. The name tag must be worn in plain sight on the person’s right chest area. Parents/guardians will also receive a yellow armband to wear which must be worn and visible to identify them. If the band comes off or is lost, notify nursing staff to replace the band immediately. CHOC patients are required to wear identification bands for safety and security reasons. If the band comes off or is lost, notify nursing staff to replace the band immediately. You must have a physician’s order for your child to leave the floor. When you leave to go to the gift shop, Turtle Talk, radio station and cafeteria you must let your nurse know. The nurse will provide you an orange badge for your child to wear. All of our employees and staff physicians wear a hospital badge so they can be easily identified. It’s a good idea to become familiar with the hospital staff working in the unit where your child is staying. Do not leave your child with anyone who is not wearing a CHOC identification badge or without knowing where your child will be taken and how long the tests will take. Please notify the nurse immediately if you see any unfamiliar person(s) entering your child’s room or asking about your child. While your child is in the hospital, members of the health care team will come to evaluate the status of the child many times throughout the day and night. This includes the nurse, the respiratory therapist, the physicians and any other members of the team needed to provide the best possible care. If you have a question regarding anyone’s role in your child’s care, please feel free to ask. CHOC Children’s is a training hospital for health care providers who are receiving additional education. That means that in addition to CHOC physicians and nurses, your child’s care team might include medical students, residents or fellows, who have learned the very latest medical practices in the classroom and are bringing these advancements to the bedside. Students, residents and fellows may participate in a child’s care but are not the primary caregivers. They are closely supervised by physicians with more experience, so you will always receive the expert care you expect from CHOC. These supervising physicians are not only excellent doctors, but also talented teachers. Although the number of people involved in your child’s care may seem like a lot, rest assured that the team is working closely together to make the best decisions about the care of your child. A badge with a purple Choco bear indicates a CHOC Children’s physician. CHOC physicians are fully educated, trained and licensed to practice medicine. A badge with a green Choco bear indicates a resident or fellow. These doctors have completed medical school and are receiving additional training in a specialized area. A badge with an orange Choco bear indicates a medical student. These providers are in their third or fourth year of medical school. A badge with a red Choco bear indicates a nursing student. These nurses are nearing the end of their medical education. Your child’s physicians will work with other members of the health care team to take care of your child. They evaluate your child’s condition daily and determine what tests, medicines and treatments your child needs. You will have one nurse assigned to your child during each nursing shift around the clock. The nurse makes sure all planned and ordered care and treatments are performed for your child. They will also be taking care of other patients on the unit. Respiratory therapists have had special training in treating lung problems and will be working with the other members of the health care team to provide care for your child. Rehabilitation Services provide occupational, physical and speech therapists to assist your child in meeting developmental milestones, managing functional limitations of any kind and/or restoring function where it once existed. Occupational therapists will work with your child on self-care skills like dressing, grooming, hygiene, toilet, feeding, swallowing, sensory integration and occupational roles. Speech therapists work on functional communication, language development, cognition and play development, along with feeding and swallowing. Rehabilitation Services provide therapy services to both inpatients and outpatients. CHOC is a true advocate in managing your child’s pain. Your nurse will use a pain scale to help understand how much pain your child feels. The nurse can help your child with the pain they are feeling in several ways. In addition to medication, they can use relaxation methods and coping strategies to help ease your child’s pain. Services are available at CHOC to help you learn and assist with these methods. Please ask your child’s doctor or nurse what to expect regarding pain and pain management. We want you to feel comfortable discussing pain relief options. CHOC’s registered dietitians are specialists in the nutritional care of babies and children of all ages. The dietitians work with doctors, nurses, therapists and many other individuals to support your child. Upon admission to the hospital, all of our patients are screened by the nutrition department to determine how our dietitians might be able to assist in the hospital care plan. They might assist by teaching you about a special diet, providing formula instructions or advising on specialized nutrition support. CHOC has certified lactation consultants on staff available for consultation to assist new and experienced moms who may have concerns or need support in breastfeeding a premature or sick baby. To support the nutritional needs of nursing babies, electric breast pumps and a quiet place to pump milk are available for all breastfeeding moms. A case manager is assigned to every patient. The case manager is responsible for discharge planning, care coordination and communicating with insurance companies about insurance-related issues. Child Life specialists assist patients and families in adjusting to the hospital environment. They offer developmental stimulation for your child, activities while preparing for procedures, therapeutic play/ activities, special entertainment and family support and education. Social workers are professionally trained to provide counseling and support to patients and their families. They help families access community resources to meet their specific needs, such as financial and emotional support. There are support groups available for those families who may need assistance. Please contact the department at 714-509-8521 to learn more about the current support groups available. More than 1,000 energetic and dedicated volunteer workers provide vital assistance at the information desk, in the gift shop, as part of the pet therapy program and in patient care areas. If you are interested in volunteering, call 714-509-8673. At CHOC, we are committed to taking a leadership role in ensuring the health and well-being of children and their families. Community Education offers awardwinning programs that promote health and well-being to children as they grow from birth through childhood and adolescence to adulthood. For information call 714- 509-8887. Interpreters/Translators offer their services to virtually all departments located on the CHOC Orange campus. Translation is available for any written document such as letters, consultations, research trials or studies, forms, invitations, and emails. Spanish is the primary language offered although interpretation is available for other languages through the Cyracom Blue Phone system. Hospital staff will follow special precautions while caring for your child in order to prevent the spread of infection. This is why you will sometimes see your child’s health care team wearing gloves, gowns, mask or goggles. They will also wash their hands or use hand sanitizer prior to and after providing care. You can help prevent the spread of germs by washing your hands and having your child wash his/her hands before eating, going to the cafeteria and after using the bathroom. Hand sanitizer should be used before and after going to the playroom. Family and visitors may be required to wear gloves, gowns or masks. If this is necessary you will see a posted isolation sign and receive instruction from your child’s nurse. In addition, you may receive information on preventing specific types of health care acquired infections such as bloodstream, urinary tract, pneumonia or surgical site infections. Spiritual care services are available seven days a week, 8 a.m. until 4:30 p.m. for all patients and their families. After hours care may be available upon request. A visit with the chaplain can be arranged by your nurse or another member of the health care team. The chaplain can arrange visitation with community clergy from your particular faith tradition. Family members may also wish to visit our Meditation and Prayer Center, located on the second floor of the Bill Holmes Tower, beside the Family Resource Center. We have developed a medical emergency team, much like 911, here at the hospital called Rapid Response Team (RRT). They are a group of doctors and nurses trained to deal with medical emergencies. Nurses and other staff may call this team if they are concerned about your child’s medical condition. We also want to partner with you, because you know your child the best. As a family member, you can call the RRT if you see a sudden change in your child’s medical condition or if there is a medical emergency. To activate the Rapid Response Team, talk to your child’s nurse and/or medical team and tell them what you are worried about. If you are still uncomfortable about your child’s condition, dial 15433 to activate Rapid Response. The phone number is posted in your room. The operator will ask you a few questions to get more information and the team will be there within 5 minutes. Please tell the team about your child’s medical emergency. During your visit, your child might have the opportunity to participate in organized events, celebrity visits and special entertainment that include video and photography of patients. A parent or legal guardian must provide written consent to allow for videos or photographs to be taken of minor patients. Without a consent they cannot be photographed. The term “photograph” includes video or still photography, in digital or any other format, and any other means of recording or reproducing of images and/or audio. The use of these photographs/video will be used for traditional media, social media, education, brochures, advertisements, websites, etc. In these situations, a CHOC staff member will provide parents or legal guardians with a form to be completed and signed granting such permission. The staff member can answer any questions you may have about the form. If you are not comfortable with your child being photographed, please notify a CHOC staff member immediately. You are under no obligation to provide consent for photography. Please do not take photos or video recordings of anyone without their permission. This includes individuals who are the direct subjects of your photo or video, as well as those in the background. Taking photos or video recordings is not allowed in areas where treatment is actively occurring. If a member of our staff believes patient care is being compromised or that an individual’s safety or privacy has been violated, you or your family members may be asked to stop recording, delete photos or videos from your device, and/or leave the room or area.